Tho ' they may gang a kenning wrang. In this cast were JH Stoddart, Herbert Kelcey, Louis Massen, WJ Lemoyne, EM Holland, CP Flockton, William Davidge, Frank Drew, Walden Ramsey, Herbert Milward, Mr. MB Hofman, Henry Hogan, Marie Burroughs, Mrs. EJ Phillips, Miss Lizzy Duroy, and Marie Greenwald, and "School Children, Members of Congregation, etc. "Music was under the direction of Frank A. Howson. The sets were designed and painted by Richard Marston. Also credited were Matthew Lynch, Master Machinist and Lawrence McGivney, Gas and Lights. 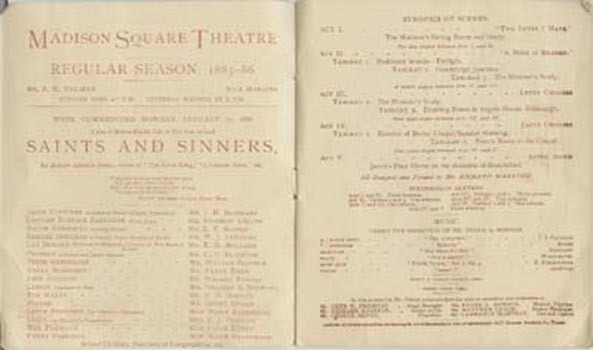 On the afternoon of April 21st [1887 was offered] a testimonial to William Pleater Davidge, in commemoration of his fiftieth year of active service on the stage" including John Gilbert and Herbert Kelcey, Davidge's colleagues from the Madison Square Theatre -- Stoddart, Holland...Massen, Holliday, Millward and Marie Burroughs in the third act of Saints and Sinners [Odell] EJ Phillips was part of this performance. Davidge played Peter Greenacre in Saints and Sinners, described as "a disreputable old man, with evidences of hard drinking"
Boston, May 8, 1886 I cannot yet tell you how I shall be able to arrange for [Hattie] visiting you as if I possibly can, I would like to go with her and that will depend upon whether Sealed Instructions will be done or not. If Saints & Sinners should please the 1st week, I think it's likely they may play it the last week. If so, I cannot go to see you. An article in Pueblo's Colorado Daily Chieftain Sept 9 1886 listed the 26 people inPalmer's Madison Square Theater Company as Herbert Kelscey, "an actor who possesses youth, grance and earnestness, Frederick Robinson, who has remarkable versatiity and great experience, W>B> LeMoyne, who cannot be equalled for dry humor and comic eccentricity of characters, James H Stoddart, who is perfection in his line of bizarre parts, Louise Massen a handsome and earnest performer;' Caroline hill, an actress of wide repute for her beauty and professional ptalents; Maude harrison, a sparkling young actress full of glee and capable of deft touches of sudden tenderness, Annie Russell, a bright and winning little actress clever in the portraiture ofinnocent, demure, roguish and charming girls, Mrs. EJ Phillips, a fine representative of old women, equally successful in those of maternal dignity and those of a formidable character; Marie Burroughs, a singularly sweet and fascinating artist with a well deserved reputation for talent and intelligence; and Walden ramsey, Harry Holiday, H Milwartd, JW Batten, GW Presbrey, May Brookyn, Virginia Buchanan, Mayt Robson, Marie Greenwald will also be members of the company, as well as the three famous comedians, William Davidge, CP Flockton and EM Holland." San Francisco, Aug. 21, 1886 Business has been very large this week for Saints & Sinners. Every seat is taken for today's Matinee. Salt Lake City, Sept. 14,1886 Last night we opened to a crowded house and that means something here, for the auditorium of the Mormon Theatre is pretty well as large as the Grand Opera House, NY. Saints & Sinners never went better. ..Thursday we leave at 11:30 AM for Pueblo to play there on Friday night. Sat night Colorado Springs. Spend Sunday there. Monday morning, go to Denver about four hours ride. Remain there one week. 7 Saints and Sinners go to Kansas City for three nights & Matinee, St Jo on Thursday, Omaha Friday and Saturday. Salt Lake City, Sept. 15, 1886 We leave tomorrow 11:30 AM en route to Colorado Springs where we, if on time, are due at 6:50 PM on Saturday - scarcely time to go to hotel before going to theatre to play Saints & Sinners, Monday AM go to Denver. I shall not play more than four times in Denver, twice in S[aints] & S[inners] and twice in Our Society, but the last week I shall have to play every night in S[aints] & S[inners]. Denver, Sept. 20  Arrived from Colorado Springs at 12 noon. Feel tired and want to rest. Arrived at Colorado Springs at 9 PM on Saturday and gave a performance of Saints & Sinners, pretty tough work for an old woman. Chicago, July 2, 1887 The weather has been very warm for the past week and to-day promises to excel the other days in intensity. And we have two performances of Saints & Sinners to go through. Hard on Mr. [JH] Stoddart, his part being very long and he has to wear such heavy old coats. Boston, Spring 1888 Things generally are in a muddle. The plays to be done in San F'co are Saints and Sinners, Partners, Heart of Hearts, Jim the Penman, and another play that A.M. [Palmer] thinks I will not be in. Wissinoming, June 8, 1890 The heat of the weather being so intense, I was deprived of strength and motion and could not attend to half of the things I wanted to. I rehearsed on Thursday in Saints & Sinners and on Saturday in Capt. Swift. Tacoma, June 25, 1890 Good Matinee for "Saints & Sinners". Last night house $1400. San Francisco, July 8, 1890 We had a splendid house last night, and rec'd very fine receptions, mine being second to none in warmth and enthusiasm. The papers today speak highly of the performances, but do not seem to care for the play. We play it all week, and next week Jim - following week Aunt Jack, 4th week S[aints] & S[inners] and the 5th week a repetition of each I suppose. This is a dull month here. Omaha, Sept. 12, 1890 Last night we left St Joseph after performance. We played Saints & Sinners to a very fine house. Had a nice sleeping car and a section all to myself which is always a great comfort. I do not play tonight, but do twice tomorrow and leave for Chicago at 12:45 on Sunday Afternoon. Due in Chicago 7 AM Monday. Chicago, Sept, 15, 1890 Hear that AMP[almer] is to be here on Friday when we shall be told something about business I suppose. Should Aunt Jack not catch on tonight we may have to play Saints & Sinners next week & possibly Capt. Swift, so I have to remain here. Chicago, Sept. 18, 1890 I will not have so easy a time here as I expected, having to play next week in Saints & Sinners. I have been taking a good rest this week and I needed it for I was not feeling very well, and on Tuesday went to Dr. Ogden to get some medicine. He said the trouble came from so many changes of food and water. Philadelphia, Oct. 7,1890 Aunt Jack this week. Next week Capt. Swift, Saints & Sinners and Jim the Penman. I am in all three plays and we give a Wednesday & Sat Matinee. Philadelphia, Oct. 20, 1890 Saints & Sinners being so late on Friday night I could not catch the 1:17 train, so I took a room at the Stratford Hotel, Broad Street for the night, and did not return here until after performance of Jim [the Penman] on Saturday night. New York, Dec. 24, 1890 I have to tell you that I am going out of the City for four weeks with the Madison Square Co. Two weeks to Phila and two to Boston, so that it will be Feby before I return to New York. They are afraid A Pair of Spectacles will not be sufficiently strong to run two weeks in those cities, and are going prepared to change the programme for the 2nd week in each place -- doing Jim the Penman, Saints & Sinners, Capt. Swift, and Aunt Jack. Besides it is possible that a new play will be put into rehearsal during our journey, which we shall produce on our return to the City. New York, Mar 24, 1891 I told you our season would close about the 1st of May but on going to the theatre last night I was informed through an official notice that the season closes on the 18th of April and the Company leaves on the 19th (Sunday) for Washington DC. The plays are Jim, Saints & Sinners, Capt. Swift, Pharisee, [A Pair of] Spectacles, Sunlight and Shadow. I was told the "Madison Square" [Theatre] was rented to someone [a production of Martha Morton's The Merchant] for the Summer, hence the sudden change I suppose. No one seems to like the change, but all have to put up with it. Detroit, Dec. 13, 1892 Have had a letter from Maud [Harrison] this Morning. A.M. [Palmer] takes a company to Boston on the 26th of Decr. They are to open with Saints & Sinners (New play) don't it, eh? Miss [Julia] Arthur is to play Maud's part. He has left Maud out in the cold. Also Mrs. [Agnes] Booth. Miss [May] Brookyn takes her place in the plays that are to follow. The engagement is for 4 or 6 weeks, then they are to open in New York with Lady Windermere's Fan. Glad I did not wait for A.M. P[almer]. Jackson, Russell, Plays by Henry Arthur Jones, New York : Cambridge University Press, 1982. 1890 12 23 New York NY Jim the Penman Saints & Sinners Capt Swift Madison Square Co to Phila 2 weeks Boston 2 weeks?